Launchkey Mini MIDI Keyboard by Novation is very interesting portable device. It features 25 keys with very simple interface and fantastic price. But is it really worth to buy? Let´s take a closer look at it and find it out. You will probably love it for the very small dimensions it has. Launchkey mini has sizes just 15,5 x 9 x 3 inches while weighting only 1,5 lbs, so we can say that it´s really, portable. The main advantage is that you don´t need any special equipment or cables, this device is powered by USB and it´s plug and play – no further setting up, just plug it and enjoy it. Launchkey comes with 25 keys, 16 velocity pads with three colors, eight knobs and seven buttons. It´s also connectible with iPad app. This is a solid bunch of advantages for price just 100 dollars. Launchkey Mini is smaller than other keyboards so it will maybe take some time to get along with it. However, once you get used to it you will probably don´t notice small size of the keys anymore. The same goes for pads, which works exactly as they are intended to work and colors will help you with orientation in darker places. As we stated before, this device only needs a USB cable to get power. So it´s as simple as possible and the drivers for computer will be installed automatically for most of the cases. After a short term you will be able to play with full functionality. Simple question with simple answer – yes, it is. For just 100 dollars you get nice compact and portable MIDI keyboard with good range of interesting samples and possibility to connect it to external iPad app. Compact sizes will definitely take some time to get along with it, but after short period of time you will love it. This really compact and portable MIDI keyboard controller gives you everything you need to work in Ableton Live. 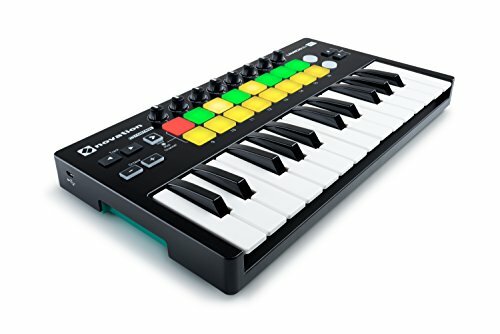 Launchkey Mini great for a beginner with no knowledge of midi keyboards.